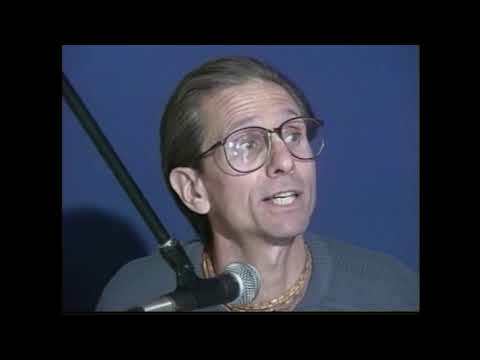 You can get all these wonderful videos on Siddhanta's website of "Prabhupada Memories"
With the publication in video and print of Memories: Anecdotes of a Modern Day Saint, Siddhanta has made a contribution of monumental and historical proportions to our understanding of Srila Prabhupada, the modern Gaudiya Vaisnava movement, and human religiosity in general. All too often, the contemporary followers of a great religious leader have failed to adequately record his or her life and teachings, resulting in long centuries of frequently futile debate and conflict among historians and religionists alike. Thus Siddhanta’s documentation in both video and print of the testimonies of Srila Prabhupada’s disciples about their master provides an invaluable, irreplaceable, and unique treasure of information to all those who desire today, or seek in the future, an accurate, reliable, true picture of Srila Prabhupada, the Founder-Acharya of the International Society for Krishna Consciousness. Siddhanta’s patient, creative and professional work will surely be seen by future generations as one of our generation’s greatest contributions to the human family. Thus it is with the soundest of reasons that I acknowledge here my deep personal gratitude to Siddhanta, congratulate him on his outstanding achievement, and urge all those seriously interested, for whatever reason, in Krishna, Srila Prabhupada, ISKCON, and spirituality itself, to stock the favorite shelves of their library with the singular treasures of the Memories series. MY FIRST CONTACT with the Hare Krishna movement came in the summer of 1969 when I saw it’s members chanting on the streets of Hollywood. My initial reaction to the shaven heads, saffron-colored robes, and seemingly strange activity, was one of bewilderment and to some degree, comic relief. It was not until a year later that I was able to appreciate the sound philosophy that stems from one of the world’s oldest religious traditions. I soon realized that there was a tremendous wealth of knowledge and logic behind the activities of the International Society for Krishna Consciousness and that it was far from being a new “hippie” cult. In fact, the information I obtained by reading my first Back to Godhead magazine answered all the questions I ever had regarding life, its purpose, and more. It was in Dallas in 1970 when I actually came in personal contact with the author of that Back to Godhead magazine, the Founder-Acharya of the Hare Krishna movement, His Divine Grace A.C. Bhaktivedanta Swami Srila Prabhupada. I greeted him along with the other devotees at the airport and then followed the procession back to the temple, where Prabhupada gave a Sunday Feast lecture. What struck me most about that lecture more than anything was Prabhupada’s answer to one question that was asked of him by a member of the audience. 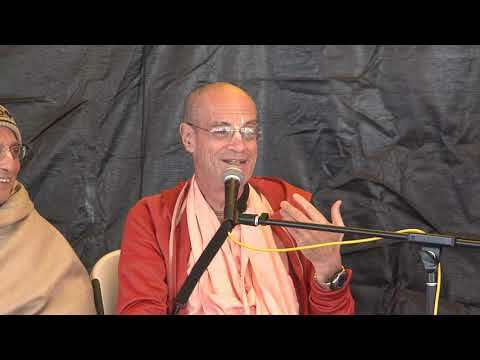 In his lecture, Srila Prabhupada had been stressing the importance of chanting the Hare Krishna maha-mantra: Hare Krishna Hare Krishna, Krishna Krishna Hare Hare, Hare Rama Hare Rama, Rama Rama Hare Hare. The guest asked what Srila Prabhupada personally felt when he chanted this mantra. Without hesitation, Srila Prabhupada answered, “I feel no fear.” Because his response was so immediate and filled with such conviction, I immediately sensed in my heart that not only what he said was absolutely true, but that he was in direct contact with God. I obviously felt an urgency to try the same mantra meditation process myself. Over time it became apparent to many who observed him first hand that Srila Prabhupada was steadily situated in a higher state of consciousness beyond anything that was part of our common experience. But that was not all. After a further study of the teachings in his books and observing his interactions with others, I realized that here was a person who was not materially motivated. He was not interested in mundane acquisition, exploitation, or adoration. He was also in complete control of his senses, the very foundation of all yoga practice. By his own example, he was a perfect teacher of the divine process of devotional service or bhakti-yoga. And by means of his unconditional love and devotion, he was in touch with and connected with the Supreme Being. His mission appeared to be for all of our best interests by making me, and everyone else who cared to listen, spiritually happy by engaging our mind, body and soul in serving God, Krishna. Srila Prabhupada taught that as a fish out of water cannot be happy out of its constitutional element, similarly we as spiritual beings cannot be happy simply engaging in activities meant to satisfy our material senses. Years later, after accepting Srila Prabhupada as a pure representative of God and having taken spiritual initiation from him, I had the opportunity to personally be with him again when he visited the temple in Denver, Colorado. My previous conviction that Prabhupada was in direct contact with the Absolute Truth was further solidified when I offered flowers at his feet and our eyes met. When Srila Prabhupada looked at me, he looked right through the external me, touching the internal me, the soul. I felt naked in front of him, feeling as though he could not only read my mind but my heart as well. It was the most humbling and purifying experience of my life. That morning during Srila Prabhupada’s daily walk, he was talking about prasadam, food offered to God before it is personally consumed. Prabhupada said prasadam is so spiritually potent that if a human being simply eats prasadam once, in his next life he will take birth in a wealthy family or a family of devotees. He then stated that if an animal eats prasadam, in its next life it will immediately take birth in the human form of life, jumping over all other species of life that a living entity would normally have to pass through before obtaining a human birth in the process of transmigration of the soul. In his kindness, Prabhupada helped me realize my foolishness to think I had to fulfill the expectations of the public by having a nine to five job. I had been affected by the negative feedback I received from the people I met, but Prabhupada reminded me that the point of life is self-realization, and our role in the varnashram scheme of things was to remind others of that fact. He had dispelled my doubts with the torchlight of knowledge. Later on, I realized that if I had this small glimpse of truth from being with Srila Prabhupada for such a brief period of time, there had to be many more devotees who had just as much or more association with His Divine Grace who could also share their experiences and realizations. 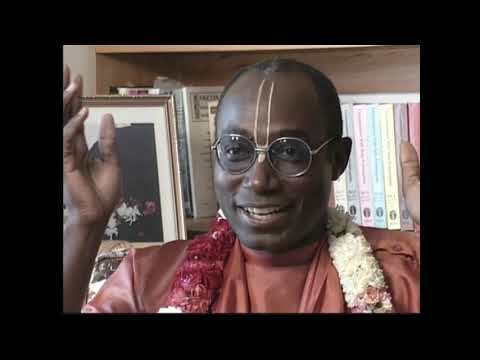 It was obvious that each devotee’s encounter would be unique and would reveal other aspects of Srila Prabhupada’s personality and boundless wisdom that were not necessarily contained within his transcendental books. I believed that these encounters with Krishna’s pure devotee not only inspired the devotees at the time but could help anyone who hears these lessons in his or her present daily lives. It is with that belief that I ventured out to acquire the stories contained in this book. These stories are not only informative but also entertaining and inspiring in the way the devotees express themselves, seemingly going into a regression type trance as they recall those times spent with Srila Prabhupada. One poignant realization that came from one of Srila Prabhupada’s grand disciples was that through these memories we can learn about the qualities of Prabhupada and thus develop our attraction and love for him. 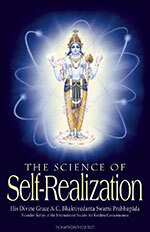 Just as we become attracted to and ultimately love Krishna by learning about His qualities and activities from reading them in the Krsna Book, we can also develop love for Srila Prabhupada by becoming aware of his compassion, humility, wisdom, humor, wit, knowledge, determination, love and how he dealt with life in a practical Krishna conscious manner. From a historical standpoint, it seemed important as well to record these personal instructions thinking that if someone had been able to record the recollections of the disciples of Jesus Christ, that those memories would be extremely meaningful today. So starting in 1991, the process of obtaining the oral histories of Srila Prabhupada’s disciples began through videotaped sessions and subsequently transcribed to be presented in this book form. There are no hard and fast rules in reading this collection of memories, as they are not recorded in any chronological order or by subject matter. The memories are simply a stream of consciousness by each devotee, and therefore, can be read in a nonlinear fashion. 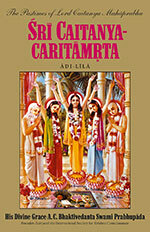 This book is meant to be, as Srila Prabhupada stated once about his books, readable in such a way that one can start in the middle and still derive sweetness, as biting into candy anywhere will result in the same sweet taste. As there were some five thousand initiated disciples, this process has just begun, and we hope that there will be more volumes to come in the future. 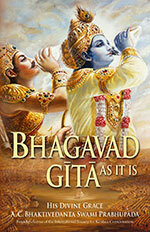 We must thank Bhargava Prabhu for his photographs that appear as the cover artwork. He certainly was blessed with a great eye. This production could not be possible without the hard and diligent work of our transcribers, Dinadayadri dasi, Ram Prasad das, Mamata dasi, Kara Middleton, Sujana dasi, Renukah dasi, and Kapila das. We thank Sri Kanta Prabhu for his work in assembling the Glossary and Bhojadev das for his assistance with the Introduction. And lastly but certainly not least of all, our deepest appreciation goes to Vishaka devi dasi for her brilliant work in editing the transcriptions to a form that create a book that cannot be put down until the last page. This publication is also now being printed and distributed in India by the wonderful devotees in New Delhi who have understood the importance of distributing these oral histories in the land where Srila Prabhupada began his journey in spreading Krishna consciousness. My heartfelt thanks go to Nandagopal Jivan das (GKG, New Delhi) of Golden Age Media for producing this Indian publication, HG Mohan Rupa das (GKG) (TP-ISKCON-Delhi) and HG Sarvasakshi das (GKG) for their encouragement and guidance, HG Vrindavan Vinod das (GKG) for his cover design work, HG Annutama Hari das (GKG) for arranging the design and layout and Sangini Radha devi dasi for her support of her husband Nandagopal Jivan in his service to Srila Prabhupada. I must also thank HH Gopal Krishna Goswami Maharaj and HH Lokanath Swami Maharaj for referring me to Nandagopal Jivan Prabhu and confirming his integrity. 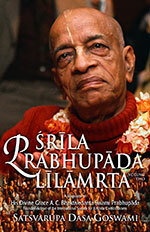 This offering to Srila Prabhupada would also not be in its present form without the hard work and patience of two members of the Back to Godhead staff: Yamaraj das who formatted the book and also beautifully designed the cover as well as Nagaraja das who contributed valuable assistance in this process. I also want to acknowledge my wife, Ajita devi dasi, and daughters Kartika devi dasi and Renukah devi dasi for their emotional and spiritual support in this ongoing project. We, of course, would be remiss not to give our heartfelt appreciation to all the devotees who shared their memories of Srila Prabhupada, and we pray that we have delivered their stories accurately. “The verdict of all revealed scriptures is that by even a moment’s association with a pure devotee, one can attain all success." 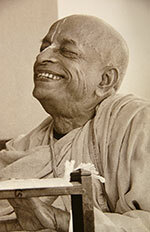 A.C. Bhaktivedanta Swami Prabhupada. These fortunate souls had that all- important association with a pure devotee of the Supreme Lord, Sri Krishna. His Divine Grace Srila Prabhupada, has been well recognized by scholars, religionists, and lay persons alike, as one of the most prominent ambassadors of India’s spiritual culture in modern times. The recollections presented here are testimony to the transcendental character of Srila Prabhupada, whose purity, compassion, knowledge, humor, humility, strength, and determination seemed to be almost effortlessly exhibited on a daily basis. To get a complete picture of Krishna consciousness, it is essential to not only have the written teachings contained within Srila Prabhupada’s books, but also how he acted in so many circumstances, so that we may follow in his footsteps, as he is a true acharya, one who teaches by example. 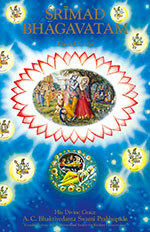 Many times Srila Prabhupada did mention that everything he wanted to tell us was in his books. Yet oral tradition is part of every society and culture, and we can only offer as a disclaimer that the interviews documented here have been accepted at face value, with the onus of veracity left to the integrity and memory of the interviewed party. However, since the interactions described in this book, were witnessed by more than one person, we as the publisher, feel all of the accounts are genuine. As mentioned in the preface to “Prabhupada Nectar”, the glories and pastimes of the Lord’s pure servants are seen to be as sweet and instructive as the Lord’s own unlimited pastimes. In the same mood of appreciation for Srila Prabhupada’s transcendental glories and instructions, we hope this volume will be of some value for initiates and novices alike who are thirsting for new or revisited facets of the spiritual jewel that is Prabhupada-sanga.